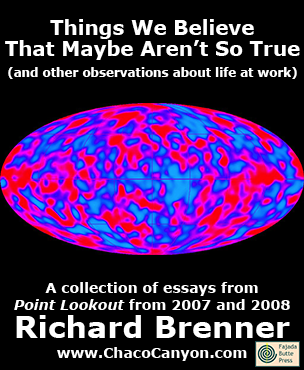 Things We Believe That Maybe Aren't So True (and other observations about life at work) is a collection of past issues of Point Lookout, my weekly email newsletter of tips, insights and perspectives that help people in dynamic problem-solving organizations find better ways to work with each other. The articles are from 2007 and 2008. The book gives concrete, nuts-and-bolts methods for dealing with real-life situations. Things We Believe That Maybe Aren't So True is a collection of short articles that give tips, insights and new perspectives on life in the modern workplace. 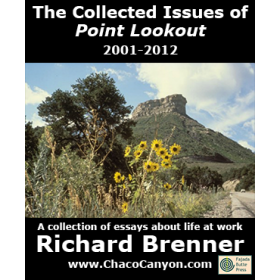 It's drawn from the 2007 and 2008 issues of my newsletter, Point Lookout , and it's filled with the insights you need to make sense of it all. It helps you avoid the traps and pitfalls that await you at work, and it guides you into new choices that can make life at work more enjoyable and rewarding. Things We Believe That Maybe Aren't So True makes a wonderful and unique gift for a friend, a colleague, or a spouse who faces any of the ordinary — and many of the not-so-ordinary — challenges of working today. When the job market eases for job seekers, we often see increases in job shifting, as people who've been biding their time make the jump. Typically, they're the people we most want to keep. How can we reduce this source of turnover? You've probably heard the slogan, "Do it right the first time." It makes sense for some kinds of work, but not for all. For more and more of the work done in modern organizations, doing it right the first time — or even trying to — might be the wrong way to go. Most of what we know about person-to-person communication applies when levels of stress are low. But when stress is high, as it is in emergencies, we're more likely to make mistakes. Knowing those mistakes in advance can be helpful in avoiding them. Stuck in uncomfortable situations, we tend to think of ourselves as trapped. But sometimes it is our own actions that keep us stuck. Understanding how these traps work is the first step to learning how to deal with them. Sometimes collaboration with people we hold in low regard can be valuable. If we enter a hostile collaboration without first accepting both the hostility and the value, we might sabotage it outside our awareness, and that can render the entire effort worthless -- or worse. What are the dynamics of hostile collaborations, and how can we do them well? Some of what we believe is true about work comes not from the culture at work, but from the larger culture. These beliefs are much more difficult to root out, but sometimes just a little consideration does help. Here are some examples. 27	What Measurements Work Well? Scope creep is the tendency of some projects to expand their goals. Usually, we think of scope creep as an unintended consequence of a series of well-intentioned choices. But sometimes, it's much more than that. Completism is the desire to create or acquire a complete set of something. In our personal lives, it drives collectors to pay high prices for rare items that "complete the set." In business it drives us to squander our resources in surprising ways. We hear a lot about best practices, but hardly anybody talks about worst practices. So as a public service, here are some of the best worst practices. Although the theory of incentives at work is changing rapidly, its goal generally remains helping employers obtain more output at lower cost. Here are some neglected effects that tend to limit the chances of achieving that goal. Some organizational cultures are healthy; some aren't. How can you tell whether your organizational culture is healthy? Here are some indicators. Some decisions are difficult because they trigger us emotionally. They involve conflicts of interest, yielding to undesirable realities, or possibly pain and suffering for the deciders or for others. How can we make these emotionally difficult decisions with greater clarity and better outcomes? Unsolicited contributions to the work of one element of a large organization, by people from another, are often annoying to the recipients. Sometimes the contributors then feel rebuffed, insulted, or frustrated. Toxic conflict can follow. We probably can't halt the flow of contributions, but we can convert it from a liability to a valuable asset. CEOs, board chairs, department heads and team leads of all kinds sometimes seek people to handle specific, time-limited tasks. Asking the group for volunteers works fine — usually. There are alternatives. When we bias organizational decisions to manage our personal risks, we're sometimes acting ethically — and sometimes not. What can we do to limit personal risk management? When solving problems, groups frequently get stuck in circular debate. Positions harden even before the issue is clear. Here's a framework for exploration that can sharpen thinking and focus the group. Whoever facilitates your distributed meetings — whether a dedicated facilitator or the meeting chair — will discover quickly that remote facilitation presents special problems. Here's a little catalog of those problems, and some suggestions for addressing them. The path to the pinnacle of many professions leads through an initiate or intern stage in which the new professional plays a role designed to facilitate learning, especially from those more experienced. For some, this role is frustrating and difficult. Comfort in the role makes learning its lessons easier. 80	It's a Wonderful Day! You're a team lead, and one of the team members is very ill or has been severely injured. How do you handle it? How do you break the news? What does the team need? What do you need? Here are some suggestions for breaking the news to the team. We all have cherished memories — lovely moments we can replay whenever we want to feel happy. How would you like to have a lot more of them? When a team relies on group discussion alone to evaluate proposals for the latest show-stopping near-disaster, it exposes itself to the risk that perfectly sound proposals might be inappropriately rejected. The source of some of this risk is the nature of group discussion. Things We Believe That Maybe Aren't So True is in Acrobat format, which gives you several advantages. You can print it, and read it like any book. Or in electronic form, you can use the search capability of Adobe Reader to find passages of special interest to you. If you load it onto your laptop, tablet, or other mobile device, you can read it anywhere — and it's weightless, too. 207 pages.